Horry County, SC, a county the size of the state of Delaware, needed 8 replacement schools in order to continue providing a sufficient and modern education for its students. 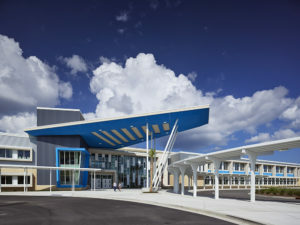 After thorough research and analysis, they invested in 5 of the 8 at once (3 middle schools, 1 intermediate school, and 1 elementary school); and as a further investment, they made the buildings completely energy-positive. This means the schools literally produce more energy than they use–a sustainable, innovative solution that also teaches the students that walk its halls in a brand new way. Two birds, one stone. Since then, all 5 schools have won awards, including being named “Best of the Best” by Engineering News-Record for K-12 schools in the Southeast. Get an inside look on each of them below. Since Socastee Middle School has opened, there has been a dramatic increase in student involvement. Participation in extra-curriculars from football to orchestra have skyrocketed because of the new and larger building’s ability to foster such growth. Additionally, the middle school received recognition as Best Project in K-12 Education by ENR Southeast (along with the 4 other schools). 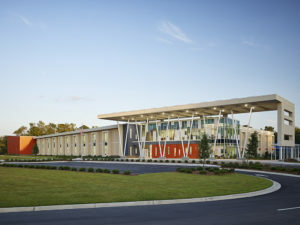 Socastee Elementary School was awarded for Education and Design for Environmental Awareness along with sister school, St. James Intermediate School (see below). This award commends them for providing teachers and students with a strategically progressive environment that is re-energizing both visually and technologically. It gives them an advantage and enables them to truly take ownership of their growth and education. In addition to the Education and Design for Environmental Awareness award, St. James Intermediate was awarded the Learning By Design Grand Prize of 2018. This architectural recognition was given to St. James for its genius energy-conserving features–such as its Thermally Active Building System (TABS) that stores latent heating or cooling energy in its concrete construction (as opposed to traditional steel-framed structures). The school’s main feature is a two-story Learning Commons, an open and flexible central area that can be adapted easily to whatever needs the school has as it grows over the years. Ten Oaks Middle has actually seen a notably beneficial change since the students began classes in the new energy-positive building. As enrollment increases, the amount of bad behavior amongst students has decreased significantly. The school’s administrators credit this change to the steps they have been making towards helping the students value the school as a place they respect and want to be. As they grow, they continue to work towards being proactive with the students and taking advantage of the growth-fostering environment they have now. Myrtle Beach Middle School was named South Carolina School of the Year by the National Energy Education Development (NEED) Project for their outstanding energy education project. The school’s Hawk Energy Club was formed this year as they moved into the new building, and they began calculating the amount of energy used by the new school compared to their old building. 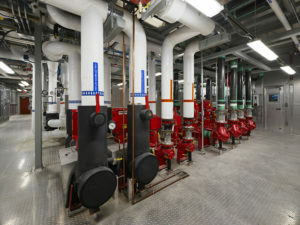 They even created a video about the school’s HVAC system and other energy efficient features.